Scientists in the US and Italy have used electricity to control atom transfer radical polymerisation (ATRP) reactions, industrially significant reactions for producing plastics. ATRP reactions allow scientists to build polymers from single units, monomers, in a piece-by-piece fashion. 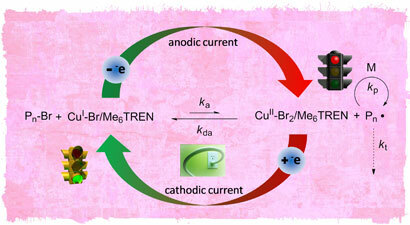 It is typically based on paired redox reactions between Cu(I) and Cu(II) complexes. A team of scientists led by Krzysztof Matyjaszewski at Carnegie Mellon University in Pittsburgh have used electricity to tinker with the ratio of Cu(I) and Cu(II) centres during the polymerisation process. 'You can adjust the ratio and therefore control the reaction - accelerate it, slow it down or even stop it completely, simply by switching the potential,' says Matyjaszewski. 'It's battery driven ATRP'. In ATRP reactions the exchange of electrons between Cu(I) and Cu(II) species can spontaneously stop, an event known as a radical termination. This leads to an accumulation of Cu(II), which ends the reaction. To counter this, reducing agents can be added. But this is problematic because impurities are introduced into the system. Furthermore, if the reducing agent is simply more of the Cu(I) complex, which is often the case, this can lead to toxic levels of copper that must be disposed of later. The team found that changing the potential to a more negative value favoured Cu(I) and increased the rate. Changing it to a less negative favoured Cu(II) and slowed the reaction down. Furthermore, using electricity instead of reducing agents to control ATRP meant that impurities were eradicated. In addition, the team reduced 100-fold the amount of copper used to 50-100ppm, resulting in a greener, less-toxic ATRP route.